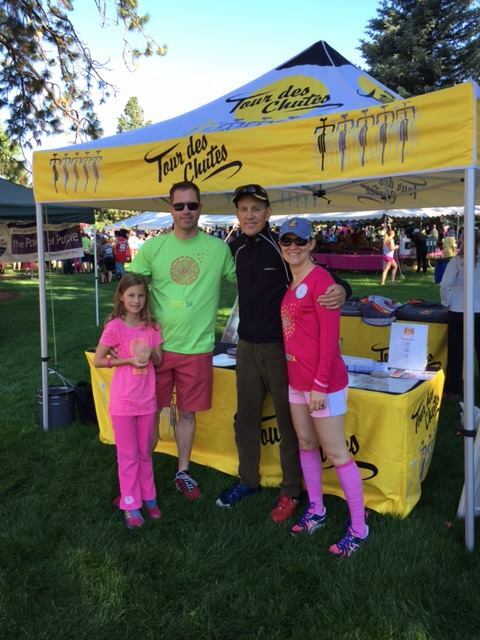 Thom Pastor is the husband of breast cancer survivor and last week’s TdC survivor highlight subject, Krista. Thom has been an active part of the Bend cycling community for quite some time, and has made a point of being an active supporter of the TdC in the past few years. In 2013, Thom (a professional chef), hosted a fundraiser dinner that was auctioned off for several hundred dollars at our July event. Here Thom has graciously and openly shared how cancer has affected him, as the spouse of a survivor, and how his experience relates to this special event. As mentioned in last week’s post, we find the Pastor family’s story inspiring in that they were both so willing to share how they each tackled this new reality in their lives, together. Because cancer is such an engrossing, enveloping disease, it not only hits those of us who are admitted to cancer care regimens. Rather, our entire families are diagnosed on day one, and how we handle this diagnosis together makes perhaps the most difference of all. Thank you, again, for sharing your journey, Krista and Thom. We are so happy to have you both riding with us, and thriving, again. “’Start where you are. Use what you can. Do what you can.’ Arthur Ashe originally spoke those words and there are none better to describe my relationship with Tour des Chutes. I first rode Tour des Chutes in 2008. My wife was years from being diagnosed and only did it to cross a 100 miler off my bucket list. The daughter of my wife’s best friend had recently beat cancer and one of my work friends was also a survivor. I thought it’d be a kind gesture to ride in their honor, and armed with a sharpie that’s what I did. I’ve ridden each year since making 2015 my 7th ride. Despite those connections, I didn’t feel the gravity of the event for many years. Three years ago I wasn’t riding with a vague connection anymore. The 2012 TdC was the first my wife Krista ever attended. It was her first year as a survivor and didn’t get to ride. She was only about one month down the road to recovery, still in very bad condition. Still, one of the volunteers made her day by giving her a yellow rose. Out on the road I was in a weird headspace. Normally a chatty ride I wasn’t talking to anyone. A few hours into it I fell in with two guys about my fitness level. This was the first year my wife’s name was the one I sharpied. At some point one of the strangers asked how she was. I choked out a few words. Somehow my goal of finishing the ride under 5 hours came out and they decided to help. They didn’t say anything, they just rode with me and we traded pulls for about 50 or so miles. Two friends helping a stranger, near silence, for hours. I only realized they were holding back to help me after we started climbing just past Tumalo Park. Maybe they sensed I needed to be alone, maybe they were bored, but they wished me well on my time goal and Krista’s health…Then dropped me like a rock. They were gone up the road and I was alone. Many people say it’s healthy to have a good cry every now and then. Just wait until you’re by yourself climbing in the summer heat with 90 miles behind you and 10 to go. I passed some survivors, got passed by other survivors, and read every name on every bib. I was thankful my sunglasses and sweat hid the tears. It was cathartic in the truest sense. It’s what I needed, and continue to need. Checking the clock at the finish, it was 11am. I couldn’t believe I hit my time goal exactly on the button. I saw the two guys a bit later and thanked them. I think we hugged, but I’m not sure because one thing TdC has is plenty of sweaty, stinky hugs. It’s hard to keep track. I found Krista sitting on a swing, frustrated, sad, and determined to ride the next year. In 2013 she did ride, and continues to. Not yet the 100 miler, but one year she will. I plan to help pull her through her first 100 mile Tour des Chutes. I’ll probably drop her on the final climb, though. Sometimes the biggest rewards come from lone pursuits. It’s not about speed, it’s about the journey.